LOS ANGELES (AP) — It was his 63rd birthday but instead of staying home to celebrate Wednesday, Andres Garcia got in his truck and drove 25 miles to Los Angeles City Hall to see the little sidewalk vending business he’s run for 15 years finally become legal. There, in the ornate City Council Chambers, he and more than 200 other sidewalk vendors — “micro-entrepreneurs” as Councilman Curren Price Jr. calls them — rose up to cheer, embrace one another and shout in Spanish, “we won, we won,” as the council voted 13-0 to legalize street vending in the nation’s second-largest city. In recent years, police have often looked the other way, he said, but he has been hassled more than once in the past when somebody complained that he stakes out space to sell chips, candy, drinks and other items in Hansen Dam Park, a popular recreational area in the farthest northeast corner of the city’s San Fernando Valley. “We need to make sure that these permits don’t cost so much that they’re burdensome for the vendors,” Councilman Bob Blumenfield said. “No longer can we say that of the 10 major cities, Los Angeles is last. That was embarrassing,” Blumenfield said. How to handle street vending in LA has been debated for a decade, and Price noted Wednesday it took five years to shepherd his ordinance to a vote. 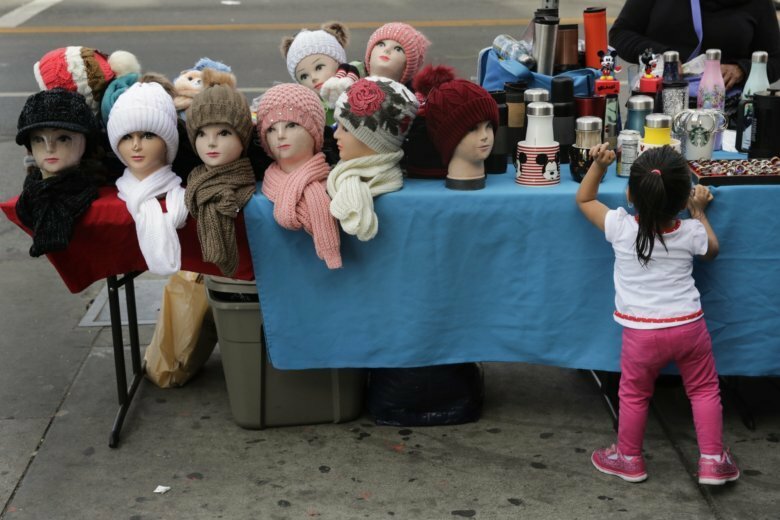 It might have taken longer if the state Legislature hadn’t passed its own street vendor law earlier this year that would have superseded anything Los Angeles did if the city didn’t have its own regulations on the books by Jan. 1. She’s on the street by 4 a.m., in time to catch the big breakfast eaters — construction workers headed into downtown Los Angeles from the East Side neighborhood of Boyle Heights. “People can feel more comfortable just doing their job now and not being in fear of having their stuff just thrown away,” she said. The mother of a 2-year-old daughter she cradled during the hearing got into the business five years ago, when she says she was alone and broke. Things have gotten better since then. The work is hard, but the money isn’t bad. “It pays the rent,” she says with a smile. After the council vote, she and more than 200 others, many wearing T-shirts proclaiming, “Legalize Street Vending,” streamed out of City Hall for a celebration on the south lawn. Food vendors were waiting for them. “Who wants a churro,” Price shouted triumphantly as other offerings — shaved ice, tropical drinks, chili dogs — went on sale nearby.